Tyrrell is part of a documentary that airs on TV3 tonight. 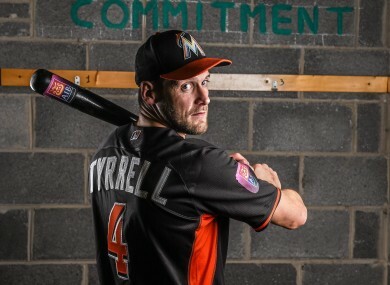 Tyrrell recently spent time with the Miami Marlins. JACKIE TYRRELL’S SPORTING career took an unexpected turn a couple of months ago. His Kilkenny hurling career was parked briefly when he got the call up to partake in the documentary ‘The Toughest Trade’ which sees Tyrrell go try out with the Miami Marlins while ex-baseball player Brian Schneider sampled life hurling with Tyrrell’s club James Stephens. Tyrrell flew to Miami the day after last month’s league clash with Dublin and spent a week immersing himself in the world of baseball. The results will be aired tonight at 10pm on TV3 but Tyrrell spoke to us yesterday about his baseball sojourn. “Jealousy and envy (was how they reacted). Everyone was asking a lot of questions — a lot of it I didn’t know myself – but they were supportive and were anxious to see how I got on in the documentary. “I’m hugely focused and I know exactly how to look after myself so I think Brian knows me at this stage and there was no problem (missing training). “The dynamics are totally different. It’s very much about mechanics. your footwork, your hip alignment, your shoulders, anything from having your chin down there to up there. “We did a conditioning day one day and at club training would do more. It was six 100 metre shuttles, 16 seconds with a 20 second break in it. Our club at home would do more. “I brought a hurl and a ball. A few of them had actually heard of it. But they couldn’t believe that the players were amateurs. They catch the ball with the glove and at one stage I was pucking with a guy only 20 yards away into his hand but the coach came over and told him to stop pucking because he feared he would break a finger. “Over there I was trying to catch the ball with the glove and I just couldn’t do it, the ball kept popping out. You have to catch it up high in the glove rather than in the palm of your hand. So I took off the glove and they thought I was crazy. They were saying ‘you won’t catch it, you won’t catch it’ but it was just like catching a hurling ball. Email “8 things we learned from Kilkenny's Jackie Tyrrell's time playing baseball in Miami”. Feedback on “8 things we learned from Kilkenny's Jackie Tyrrell's time playing baseball in Miami”.